Having a good time living the bachelor's life? Wow, you have fancy drink-ware and even more expensive liquor, a robe that the pope himself had to lounge around in, and a collection of renowned art? Sounds like you're only missing one thing. 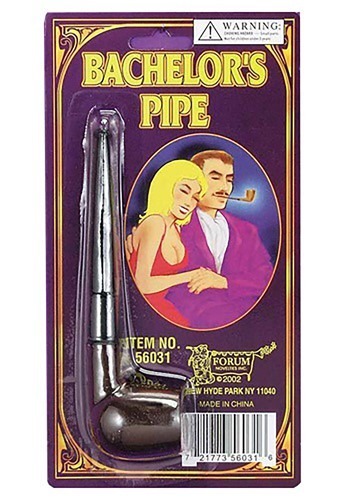 You can't be the classiest bachelor in town until you have your very own Bachelor's Pipe! We're not trying to convince you to take up smoking, it's a horrible habit, but if your goal is to be the best bachelor in your neighborhood then you certainly need to look the part. If you hope to one day be compared to the greats, like Hugh Hefner, you have to look like a class act 24/7. Any schmuck can go about their day in a robe but you'll certainly appear to be much higher class while you have this Bachelor's Pipe hanging from your mouth. If you already are a smoker then just be sure not to actually try smoking with this pipe... it is made out of plastic and will melt. So stay classy and stay away from smoking.